Air filtration according to the highest hygiene standards is critical in hospitals, especially when infectious pathogens transmissible through the air endanger patient safety. Prevent microbial contamination with high-quality, individualized filtration solutions. When the surgeon takes the scalpel in the operating room, the highest hygiene standards must be ensured. This also applies to the air filtration. The same is true in isolation rooms, where patients could transmit infectious diseases via the air (airborne spreading). Again, filters must work reliably at all times to prevent microbiological contamination. To achieve the required indoor air quality, we combine air filters of different classes and designs into multi-stage systems. Generally, a 2-stage filtration system serves to remove coarse to fine particles. In operating theaters or isolation rooms, end-stage filters are used to remove even finer particles from the air. These sensitive areas are subject to particularly strict requirements. To ensure the highest quality of clean air, the air is guided by low-turbulence displacement flow. In adjacent areas, the number of hourly air-change cycles is determined by the size of the room as well as by the equipment it contains and the numbers of people using the area. The supply of a sector with filtered air must be designed to ensure an effective flow while minimizing the risk of creating higher pressure than in adjacent areas, under all operational conditions. Improve the performance and efficiency of your air filtration system with the sophisticated Viledon filterCair filter management system. Your benefits: Energyefficient filtration system and maximum people protection with customizable packages – consisting of a comprehensive filter selection plus services and warranties at guaranteed fixed costs. Let us help you implement a high-performance and environmentally friendly system solution for your hospital to achieve a long-term reduction in your operating costs. 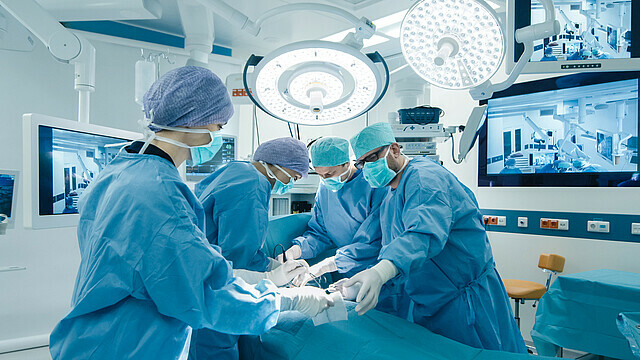 Where the highest standards of air purity are required – for example in operating rooms in hospitals – airborne particles and germs must be reduced to an absolute minimum in order to protect the patients, visitors and hospital staff. In Europe, EPA, HEPA und ULPA filters are subject to classification according to EN 1822 for filtration efficiency and zero leakage. HEPA and ULPA filters are also subject to individual tests. The international standard ISO 29463 is based on European standard EN 1822 and will probably replace this standard in the future. Both standards are based on the latest particle counting methods. Benefit from our specialized expertise for hospitals. Discover our products for hospitals.